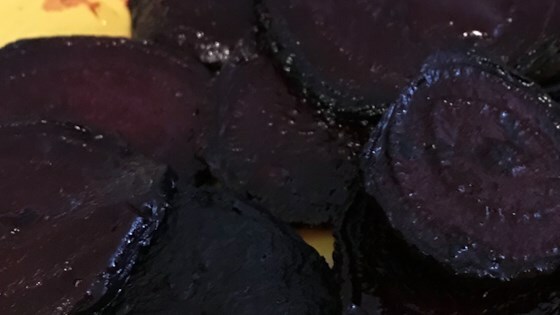 "My mom loved these and I have never heard of anyone preparing beets quite this way! Not exactly a health-food, but so tasty! Mother said, 'Cook them until they're burned.' She was right! You may also need to add a little more butter or margarine if they seem to need it." Bring a large pot of lightly salted water to a boil. Add beets and cook uncovered until slightly tender, about 20 minutes. Drain, rinse, and cut ends from each beet. Place beets in a saucepan with about 2 inches of water. Cover saucepan and bring water to a boil; cook beets until tender, about 20 minutes. Remove beets from water and immediately immerse in a bowl of ice water to cool. Pull peels off the beets. Slice beets into 1/4-inch-thick slices. Heat butter in a large skillet over medium-high heat; fry beets, flipping occasionally, until lightly blackened, about 20 minutes. Season beets with salt and pepper. It was very sweet and buttery.